So I have a nephew who seems to measure his happiness quotient for a day by the amount of Nutella he has consumed! They came to stay with us for a couple of weeks in January and in the week before they arrived – during a mid-afternoon Google-castination (i.e. 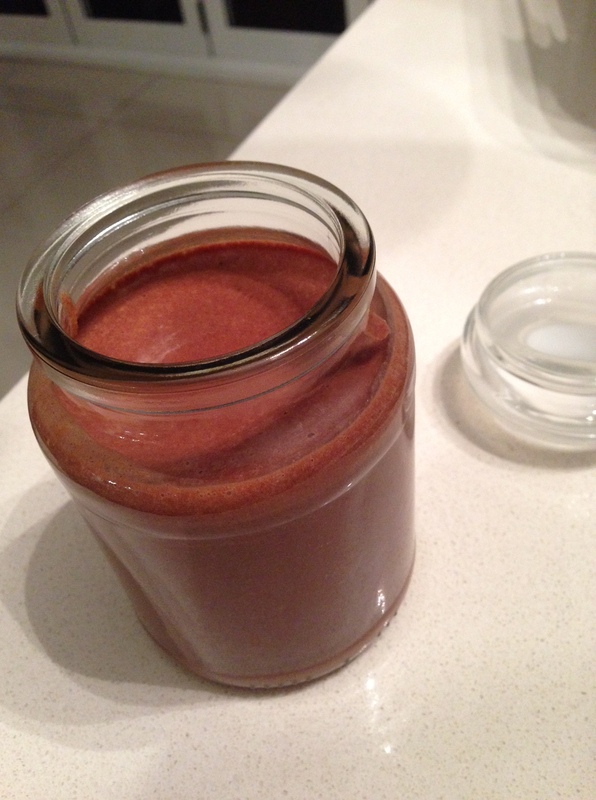 that moment when you should be working, but it’s 3/4 of the way through the day, your brain is semi-fried and you’re wondering aimlessly through the internet clicking from site to site) – I came upon a recipe on the Kidspot.com.au site by Sarah Wilson for sugar-free Nutella. PERFECT! I had found the ideal solution – my nephew would have the Nutella he loves, and my sister would be happy that it was not the sugar-laden product that he normally consumes. The recipe itself was quite simple, and I had most of the ingredients in my cupboard. Those that I didn’t have I found in my local Coles, except for the vanilla powder – which I simply substituted with vanilla extract (I’m not sure if it made any difference). 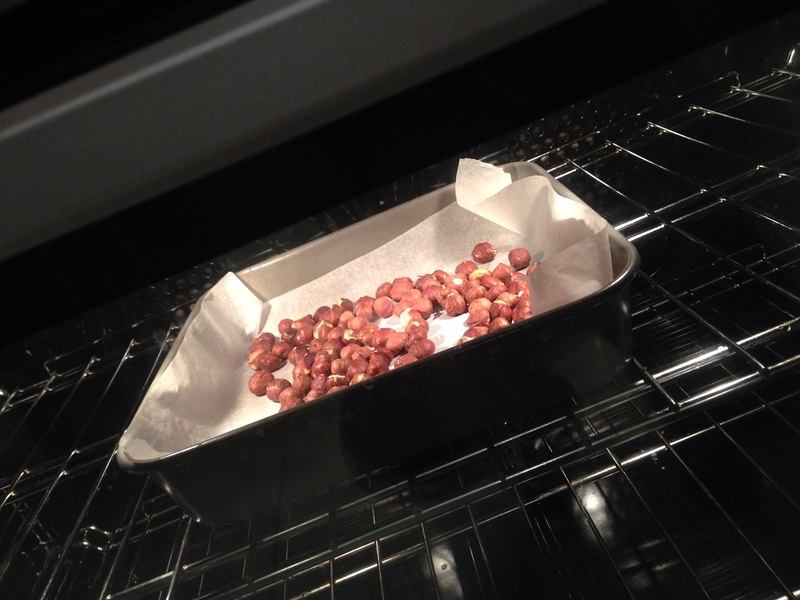 You start by heating the oven to 180 ̊C (160°C fan-forced), then baking the hazelnuts on a tray for about 10 minutes, until they are browned. Once browned remove from the oven, allow to cool for a couple of minutes and then rub off the skins. 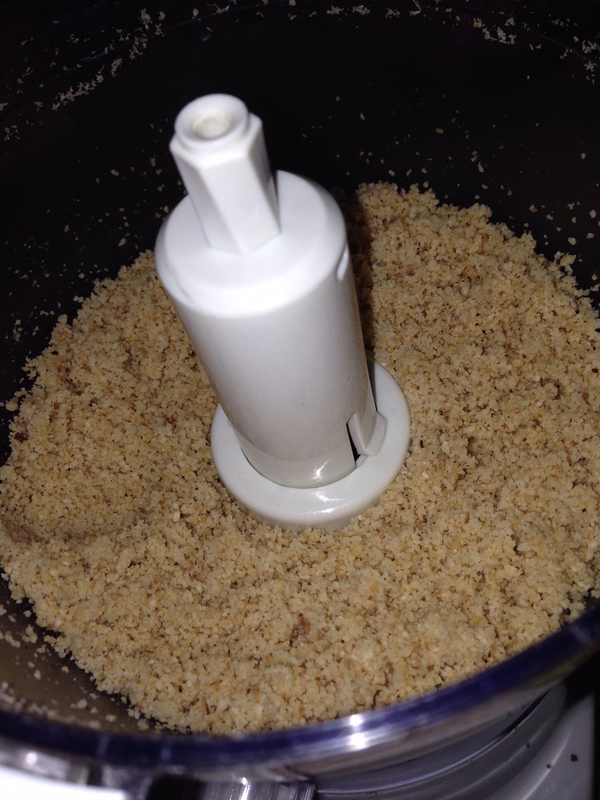 Finally, place the nuts in a food processor and grind until smooth, then add all of the remaining ingredients and mix well. Put into a jar for storage and keep in the fridge. 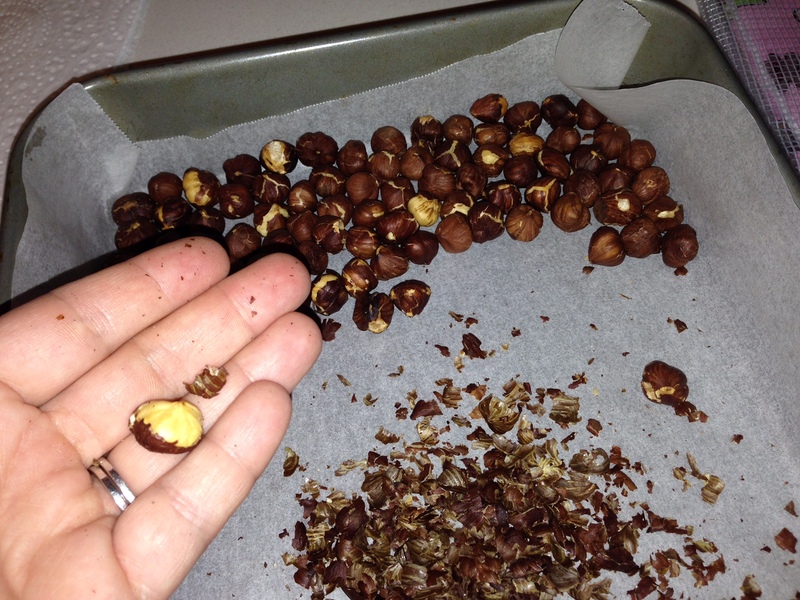 I started off by peeling the skins off of the nuts one at a time and quickly realised this would take a very long time to finish. 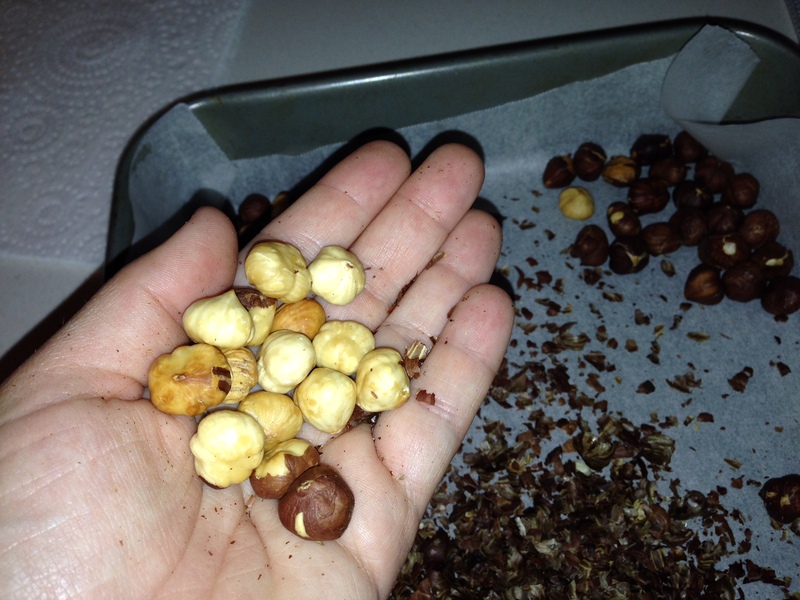 A few trial and error methods attempts to speed up the process later lead me to the perfect technique – simply take a handful at a time and rub them between your two palms. I have to say that once I blended the ingredients the mixture smelled divine – and I started to have some hope that I was on to a winner. All that remained was for the fateful taste test. My Little Miss Six was sitting at the bench watching with interest so I offered her the first spoonful to taste. I have to say that she is right – it is definitely not Nutella, but it does have an interesting flavour that is best described maybe as ‘raw and earthy’. 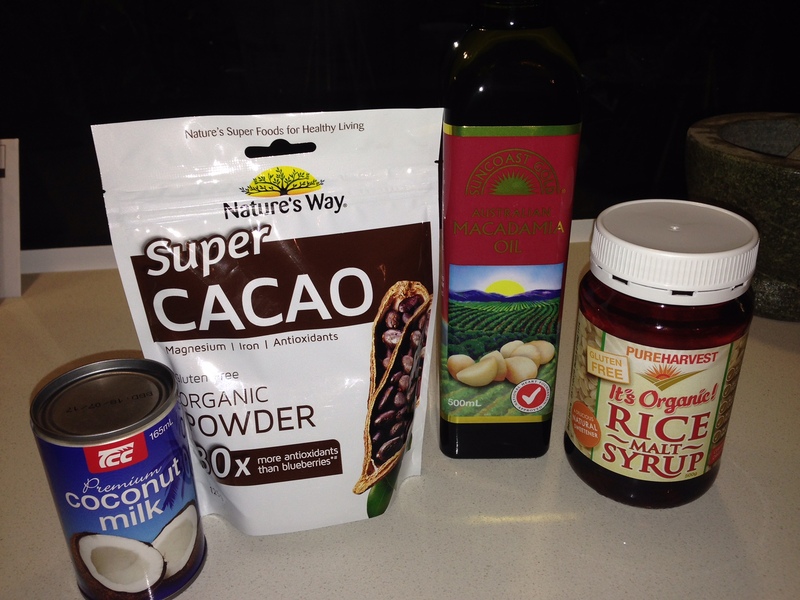 I’ve since discovered a number of other recipes for healthy versions of Nutella on the internet, so I’ll keep trying. I’m sure the right recipe is out there somewhere.